What’s next for Ariana Grande, you ask? Although she’s talked about taking a break from music, she just released a song called thank u, next to commemorate all the men she’s loved and lost, including recently deceased Mac Miller. 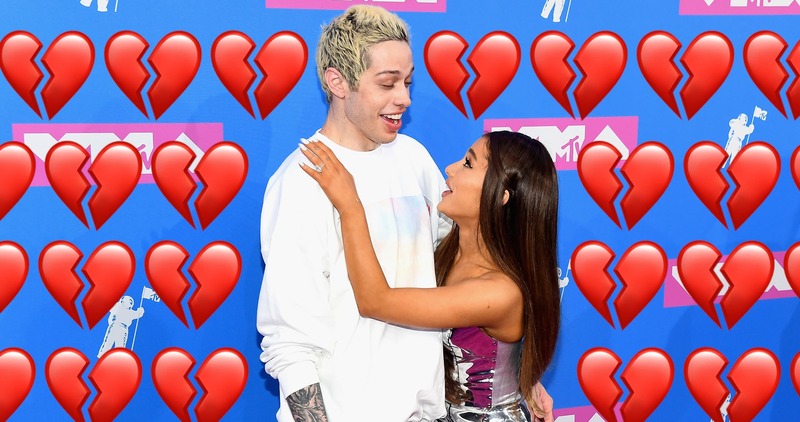 The timing of the song’s release, however, seems to be inspired by a breakup — specifically, with Saturday Night Live cast member Pete Davidson. In a recent SNL promo, Davidson decided to make jokes about their five-month-long relationship (and slightly shorter engagement). He referenced the breakup again during the show’s Weekend Update segment. Grande saw the promo online, and immediately took to Twitter, criticizing her ex. 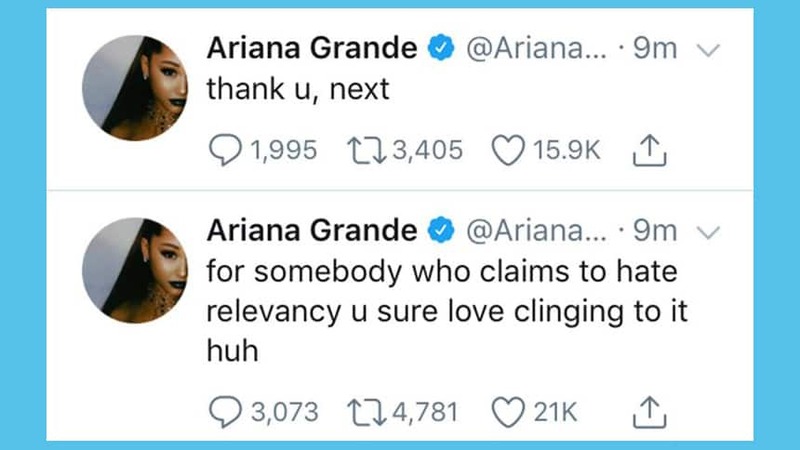 Her last tweet about it, which has since been deleted, was “thank u, next.” That was on Nov. 2. The song was made available online Nov. 3 — 30 minutes before SNL went to air. It sounds dramatic, but when you look at the timeline of this whirlwind relationship, nothing really happened slowly or quietly. They were reported to be officially dating as of May 22, 2018, shortly after Grande ended her relationship with longtime boyfriend Miller. By May 23, the couple had matching cloud tattoos. 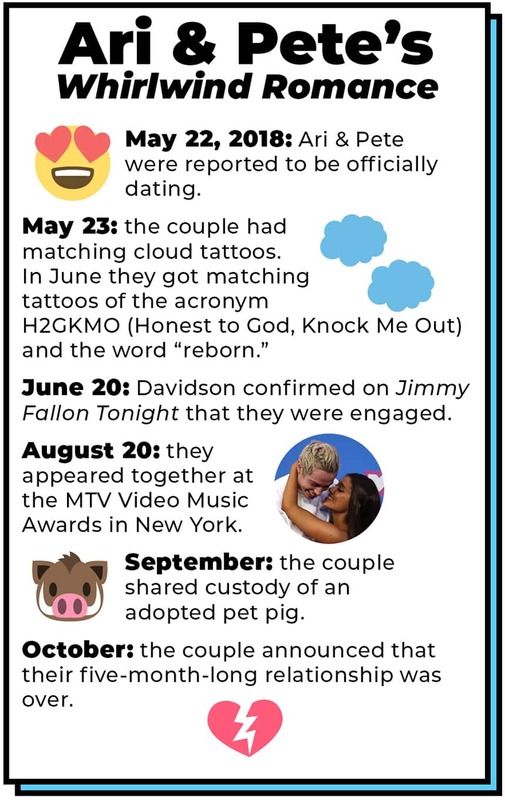 This would be the first set of matching tattoos in a string of matching tattoos — in June alone, they got tattoos of the acronym H2GKMO (Honest to God, Knock Me Out) and the word “reborn.” On June 20, Davidson confirmed on Jimmy Fallon Tonight that they were engaged. Fast forward to September, when the couple shared custody of an adopted pet pig they named Piggy Smalls (or, as it is sometimes called, Piggy Smallz). And through all of these milestones, Ari and Pete were commenting on each other’s Instagrams, defending each other in the press and generally being publicly in love. Then came October. The couple announced that their five-month-long relationship was over. And that was that. A breakup, a breakup song and some tattoos that will eventually get cleaned up (if they haven’t been already). It’s time for Ariana’s next chapter.